By general consensus, 2013’s Blue Jasmine was Woody Allen’s best movie in years — a fair assessment, although tipped tremendously by Cate Blanchett’s spectacular lead performance. Without it, Blue Jasmine would still be one of the writer-director’s more substantive and relevant recent works, albeit one whose careless stray faults would be much more conspicuous. It was particularly plain to Bay Area viewers, for example, that Allen really didn’t “get” San Francisco at all, and that some subsidiary figures (notably those played by Bobby Canavale and Andrew Dice Clay) seemed to have stepped fresh off the boat from working-class Jersey, or at least Brooklyn, albeit a generation ago. His latest, Irrational Man, doesn’t have a performance that dazzling to distract from its flaws—hardly star Joaquin Phoenix’s fault, since he’s playing a depressive, whereas Blanchett got to play nearly every note on the emotional scale as mercurial, increasingly unbalanced Jasmine. 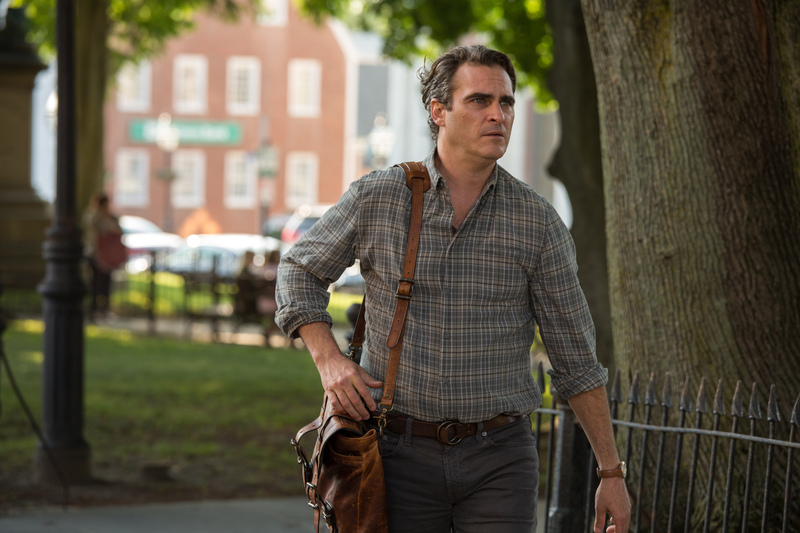 But Irrational Man may be the slightly stronger film overall, as a piece of writing and as narrative gamesmanship. If sometimes Allen seems ill-at-ease in settings foreign to him (geographically or otherwise), academia is a good fit: Characters here spout quotes from Kierkegaard, Dickinson, et al. not just because they’re the bookish director’s mouthpieces, but because they’re the sorts of people who in real life actually would. 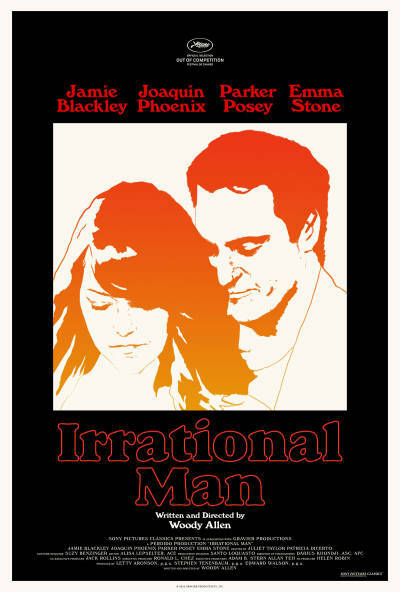 Joaquin Phoenix as Abe in Irrational Man. Credit: Photo by Sabrina Lantos © 2015 Gravier Productions, Inc.; courtesy of Sony Pictures Classics. Abe Lucas (Phoenix) is a philosophy prof with something of a wild man reputation, one reinforced by the fact that he seldom seems willing or able to keep any post for very long. Arriving at his latest gig in a terribly picturesque Rhode Island college town, he’s greeted with intense curiosity from students and fellow faculty alike. They’ve read his books and heard (often contradictory) tales of his escapades. But the Abe that lands here, while still a classroom provocateur and stubbornly asocial noncomformist elsewhere (his drinking so shameless he offers others swigs from his hip flask at high noon on the campus commons), is a onetime firebrand now doused by marital failure, middle age and intellectual paralysis. 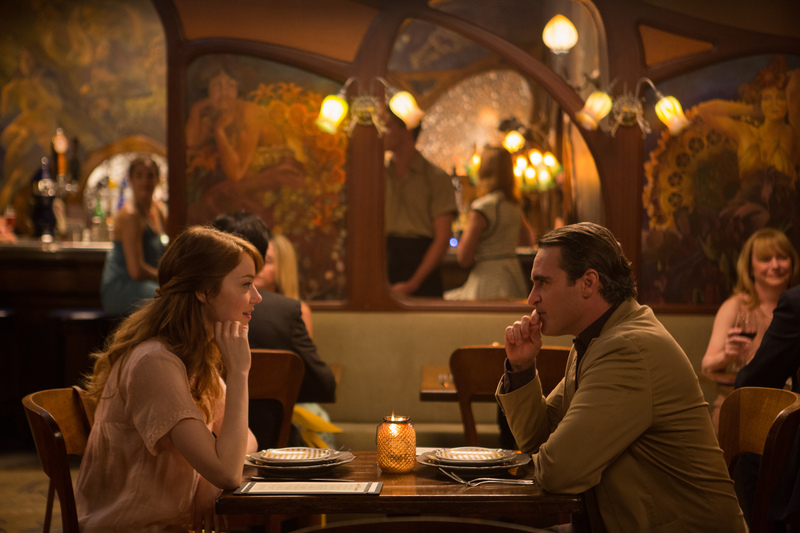 Emma Stone as Jill and Joaquin Phoenix as Abe in Irrational Man. Credit: Photo by Sabrina Lantos © 2015 Gravier Productions, Inc.; courtesy of Sony Pictures Classics. Eager to shake him out of that funk are two women who project their own needs onto his pliant, chunky flesh. Perky undergraduate Jill (Emma Stone) sees him as a fallen warrior in need of rescue by a comely young damsel such as herself. Chemistry instructor Rita (Parker Posey), a peer professionally and generationally, views him as her possible ticket out of a tedious marriage. Both make it clear they’re available to be a revivifying influence sexually. Abe declines those offers (at first), while accepting the ladies as confidantes. When he finally succumbs to Rita’s aggressive overtures, he’s unable to perform — being simply too tired of everything, his libido as somnambulant as Rip Van Winkle. Joaquin Phoenix as Abe and Parker Posey as Rita in Irrational Man. Credit: Photo by Sabrina Lantos © 2015 Gravier Productions, Inc.; courtesy of Sony Pictures Classics. But when he and Jill happen to overhear some strangers’ conversation in a diner, he develops an obsession that does for him what female flesh couldn’t: Trigger newfound energy both physical and mental. Irrational Man becomes at least the fourth Allen movie (after Crimes and Misdemeanors, Match Point, and the contrastingly dire Cassandra’s Dream) to ponder “the perfect murder” in all its practical and ethical complexities. Can murder be justified in the name of greater good? Needless to say, there’s a lot of Dostoyevskian musing as Abe not-so-hypothetically plots the demise of a person about whom he knows zilch save a few apparently damning details. As in many Hitchcock films (although without, of course, the emphasis on or flair for suspense), Allen eventually shifts our focus from whether the deed will be done to whether its guilt will be found out. An actor hardly inclined to imitate his director’s “New York neurotic” speech patterns as so many predecessors have, Phoenix provides a different center to an Allen film, one squishy and recessive rather than brittle and quippy. It’s just the right approach for this character, even if the somewhat self-effacing quality of the performance means it probably won’t be remembered by awards season. Emma Stone as Jill and Jamie Blackley as Roy in Irrational Man. Credit: Photo by Sabrina Lantos © 2015 Gravier Productions, Inc.; courtesy of Sony Pictures Classics. Parker Posey as Rita and Emma Stone as Jill in Irrational Man. Credit: Photo by Sabrina Lantos © 2015 Gravier Productions, Inc.; courtesy of Sony Pictures Classics. Posey, a performer so ideal for the Allen sensibility that he should have begun using her years ago, likewise dimensionalizes a potentially over-familiar type. Rita could’ve been interpreted as a grasping, desperate sad sack; the actress, however, employs her distinctive flippancy to provide a lifebuoy. Rita might be swimming in a sea of boredom and banality, but she’s a survivor — like a Who’s Afraid of Virginia Woolf? Martha whose bitterness doesn’t run quite so deep, her sense of adventure and wit (plus booze, when necessary) will keep her from drowning while less-resilient others sink. 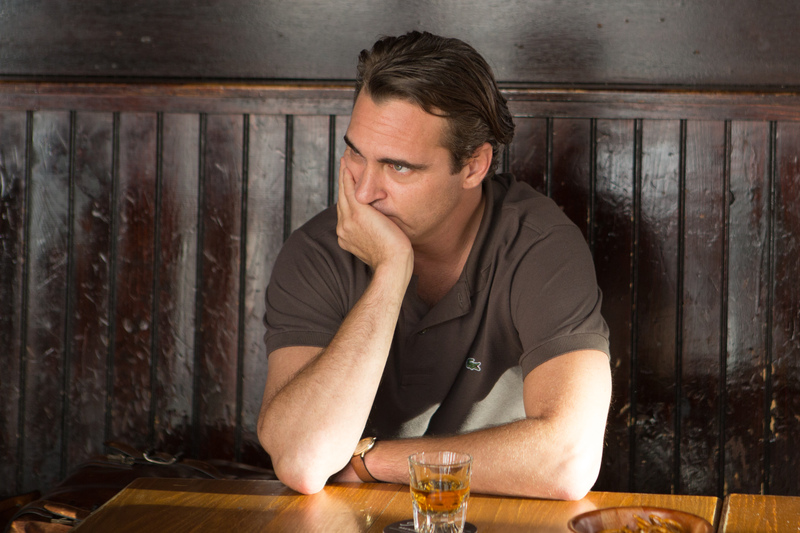 Joaquin Phoenix as Abe and Parker Posey as Rita in Irrational Man. Photo by Sabrina Lantos © 2015 Gravier Productions, Inc.; courtesy of Sony Pictures Classics. Shot by Darius Khondji, Irrational Man is a widescreen treat to look at, minimizing the pain for those who don’t buy Woody’s latest construct—or even dislike his sensibility in general. You may not leave wanting to plot the perfect crime, but after these postcard-perfect 94 minutes, you will surely want to plan a future visit to Newport, R.I. It ain’t Rome … but thank god it got a better screenplay than Allen provided To Rome With Love, a movie as clock-punching as this one is refreshingly engaged. Opens Friday, July 24, 2015 at Landmark Embarcadero in San Francisco. Opens Friday, July 31, 2015 at Sundance Kabuki in San Francisco, Landmark Albany Twin in Albany, Landmark Piedmont in Piedmont, Century 16 in Pleasant Hill, CineArts @ Palo Alto Square in Palo Alto and Regency Cinemas in San Rafael. Dennis Harvey has been publishing film reviews since the era of the typewriter. He’s a member of the San Francisco Film Critics Circle and currently writes for Variety and Fandor’s Keyframe. This entry was posted in Films, Films: Reviews and tagged Dennis Harvey, Emma Stone, Films, Joaquin Phoenix, Woody Allen. Bookmark the permalink.